Not sure who painted this but it was signed Dapres(after the style of) J.D. Van Caulaert who painted many pictures of Mistinguett. Mistinguett is shown here wearing "her tallest costume," a six foot high, blue creation designed for the show "Féerie de Paris", a tribute to the city. 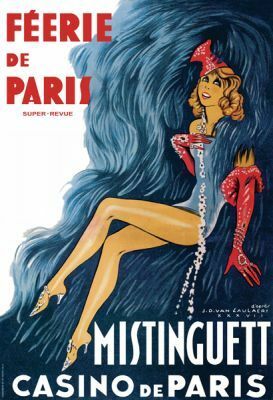 Buy Mistinguett - Feerie de Paris Vintage Advertising Poster by anon here. Page processed in 33.41 milliseconds.This figure denotes the time taken by the server to process this page.